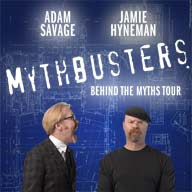 MythBusters Tour: Coming This Week! Adam and Jamie are currently bringing their own brand of crazy genius to a city near you. And this week, they are invading Canada! The MythBusters Tour hits its only two Canadian stops this week: Toronto on Thursday (aka Federal Budget Day aka my birthday) and Montreal on Friday. Naturally, we are taking a little roadtrip to the Montreal show on Friday. The Dude will even be sporting his MythBusters t-shirt, earned by dressing up as Adam for Hallowe'en a few years ago. If you don't know the story: it's the only time I ever posted a pic of the Dude on the Twitters and low-and-behold Mr. Savage (@donttrythis) not only saw it but retweeted it to his (at the time) 105,000 followers. We're all pretty excited about the show (can you tell? ;) and I will be sure to post a review next week. If you're a fellow MythBusters fan, you might be interested in knowing that there are still tickets are still available for the Montreal shows. And remember, don't try this at home!